Both sides agree that something must be done before the rhino—which has been around since prehistoric times—disappears. At the start of the 20th century, there were half a million rhinoceroses in the wild. Today, the total population hovers around 29,000, with the majority of these being the white rhino subspecies. 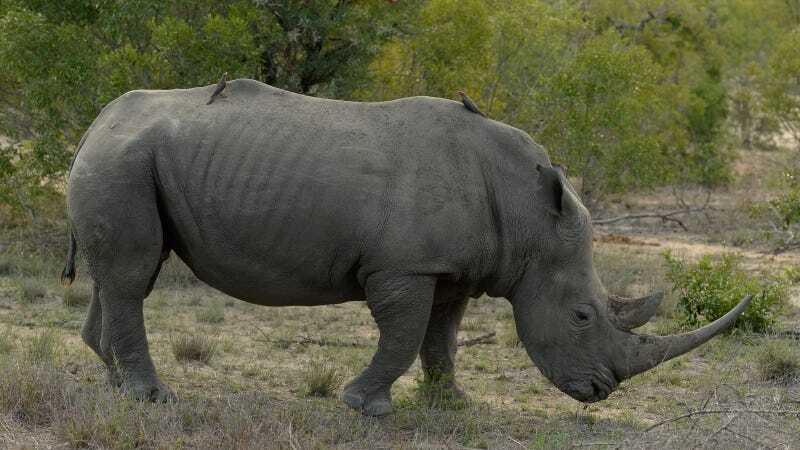 Several rhino subspecies are on the verge of extinction, numbering 100 or less in population. Meanwhile, rhino horn demand is as high as ever; the material is more valuable than gold and cocaine, and can sell for up to $27,000 a pound. Rhino horn is not bone or bony tissue. It’s made of keratin, the same material found in human hair and fingernails. Asian consumers are driving the market for actual rhino horn. For centuries rhino horn was (and still is) grounded down to powder for medicinal purposes used in Traditional Chinese Medicine. Some believe it cures everything from fever to cancer. This is a small segment of the industry. What’s causing the demand for rhino horn are wealthy patrons who see it as a status symbol. The horns are carved into art objects and jewelry. If the current demand continues, all species of rhinos could become extinct within the next decade. A cup made out of rhino horn that is now displayed in the Asian Art Museum of San Francisco. Matthew Markus, co-founder and CEO of Pembient, a biotech company that’s working to fabricate rhino horns, elephant ivory, and other animal parts with the goal of replacing the illegal wildlife trade with reproductions, believes we must solve the problem of poaching. According to Markus, many artists, carvers, and industrial designers want bio-fabricated rhino horn because it is indistinguishable from and cheaper than poached rhino horn (Pembient's fake horns contain DNA from actual rhino horns, and placed side-by-side with the real thing, it’s impossible to tell the difference). By supplying the market with more products that are ethically produced, the price of bio-fabricated rhino horn will drop “until the price of rhino horn approaches a level that disincentivizes poaching even if aggregate demand rises,” he explained. Reproducing fake rhino horns is still in it's infancy, and more suitable prototypes could take up to two years to develop. Pembient got its funding through IndieBio, a biotech company devoted to funding and building startups dedicated toward solving some of our most pressing problems. Garrett Vygantas, MD and founder of Ceratotech, a biotech company that is working to create rhino horns grown from rhino DNA, hopes to collaborate with conservation groups. “This is a save the species mission,” he said. Vygantas also wants to focus on marketing, which he believes is an essential part of getting conservation groups on board. Once products are developed, he would like each copy of lab-grown rhino horn to come with a tag or description about the rhinoceros whose DNA created the horn. Groups like Born Free USA, Save the Rhino, and International Rhino Foundation state that there is no evidence that selling synthetics or bio-fabricated horn would reduce the demand or dispel the myths around rhino horn and could indeed lead to more poaching because it increases demand for the real thing. Roberts compares this to the manufacture of synthetic bear bile as an example. “It has not reduced the practice of bear farming because consumers want the real thing,” he said. The bile from Asian black bears comes from the bear’s gallbladder. Poachers kill the bears in the wild for their bile and bears raised on factory farms have their gall bladders drained for their bile, which some practitioners of Traditional Chinese Medicine believe cures fever, gall stones, and other ailments. Scientifically, bile products have not been found to have any medical efficacy. Hume went on to say that since the horns grow back, his rhinos and rhinos on other farms can produce more horns than those slaughtered by poachers could. Roberts and other conservationists believe that it’s impossible for Hume and other farmers to keep up with demand. "Introducing rhino horn from alternative legal sources into an unpredictable market could stimulate further demand, provide a loophole into which poached rhino horn can be introduced into the market, and create huge challenges for enforcement authorities, putting the world’s remaining rhinos under even more pressure," said Roberts.